Why, oh why are we so sick of winter so early this year? We have three more weeks left in February...and all of March and probably most of April to wait before we can even begin to think about hauling out the spring fashion. Here, in snowy, frigid Ottawa...it's sheer folly to hope for a better timeline than that. And that's not to say that I don't love winter, I do. Hubby and I went for a beautiful cross-country ski today... -10 C, with bright sunshine and no wind... gorgeous! But deep down...in my heart of hearts...where my secret desires lie (okay, enough with the cliches) I really wish the weather was more like this. 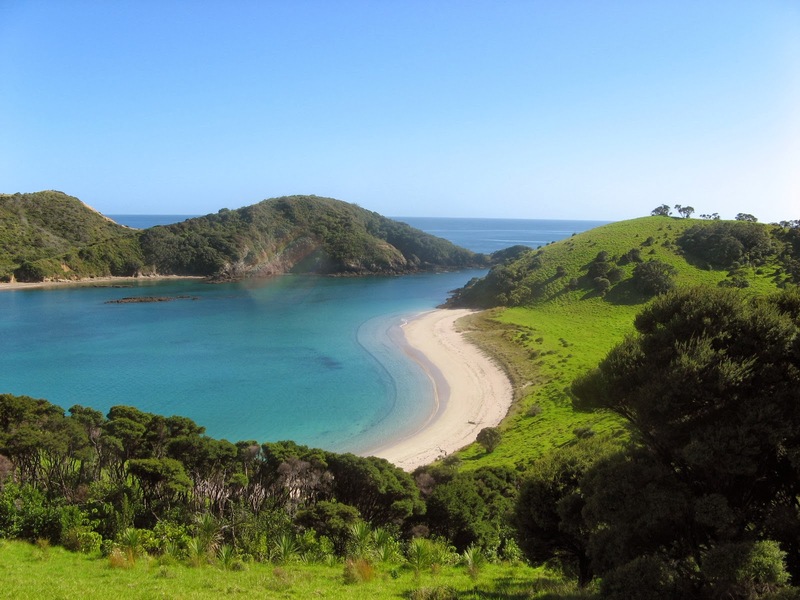 Beach in the Bay of Islands, New Zealand. And I must admit, it's mostly down to the fact that I am dead tired of all my winter clothes! So.... yesterday..... I was on my exercise bike...reading fashion magazines and listening to my i-pod. I listen to audio books while pedaling my bike. Really, it's a fantastic way to stay motivated to do something I don't really want to do. I love British mysteries and the exercise bike is a good excuse to sit around listening to books and still feel like I am achieving something. My handy husband built me a kind of lectern that's attached to my bike and holds my magazines and i-pod. So I listened and I leafed through Vogue and Bazaar and hoped for some inspiration for my wardrobe doldrums. And as I was listening and leafing, I found this ad in the March issue of Bazaar. It was love at first sight! I love, love, love that coat! I love the whole outfit. The orange coat paired with that mauve-y bag, those little white boots, the dark cropped pants with the patterned blouse...the combo of bright and dark...genius...and oh, I covet it all. Sigh. But the snow is still deep. And even when it starts to go, there will be slush and muck, so those cute, little boots are out for at least another three months. But let's not be toooo hasty here. I could substitute my black Cole Haan boots or my low Prada boots with the little heel... and I do have black, skinny pants...or maybe I could substitute my navy blue, cropped J-Brand cords. And I have a navy and white stripped blouse that coooould, maybe work. But... I simply do not have anything close to that sublime orange coat! And oooooh, I'd love to have something orange to wear! I know that pink is big this year and I've seen lots of pastels both this winter and in the new spring stuff. But pastels make me look ill, and pink brings out my rosacea. But I do love orange. It's just the pop of colour that I could pair with lots of other stuff that I already own. The pop of colour that could help a winter-weary, fashion-obsessed person like myself to survive two and a half more months of winter. Yes, yesterday afternoon I had to face the fact that that orange coat had awakened in me a longing for orange. Anything orange. But when I stopped to I think of it, I realized I already owned a few orange things. I have a V-neck, long sleeved tee shirt from Gap that's a lovely orange. I haven't worn it all winter. And I have that scarf that I bought in Ireland a couple of years ago; that has orange in it. (Slap on forehead here.) In fact, the new glasses I ordered and which I would pick up later ...are kind of orange-y. So later yesterday afternoon, I pulled out my orange tee shirt and scarf, dragged out my light, winter coat (brown Max Mara), switched up my skinny jeans for my boot-cut "7 For All Mankind" and brushed off my brown, Prada boots with the little heel that I haven't worn all winter either. And set off to pick up my new orange-y glasses. All excited to be doing the orange thing. My new glasses with my Gap tee shirt and Irish scarf. Add my Max Mara coat, boot-cut jeans and brown Prada boots. So that's me satisfied ....for now. A little pop of colour and I only shopped in my own closet. Cheaper that way! But you gotta know that that orange coat is still on my spring shopping list! What are you doing to get through the winter fashion doldrums? Thanks for reading and commenting on my blog. I do think LK Bennett is doing a good range this season. Lovely MaxMara coat. Thanks. Max Mara coats are great. They never seem to go out of style. Thanks. The scarf always reminds me of our trip to Ireland; orange and nostalgic, bonus! Thanks for the kind comments. Somewhere warm does sound inviting!